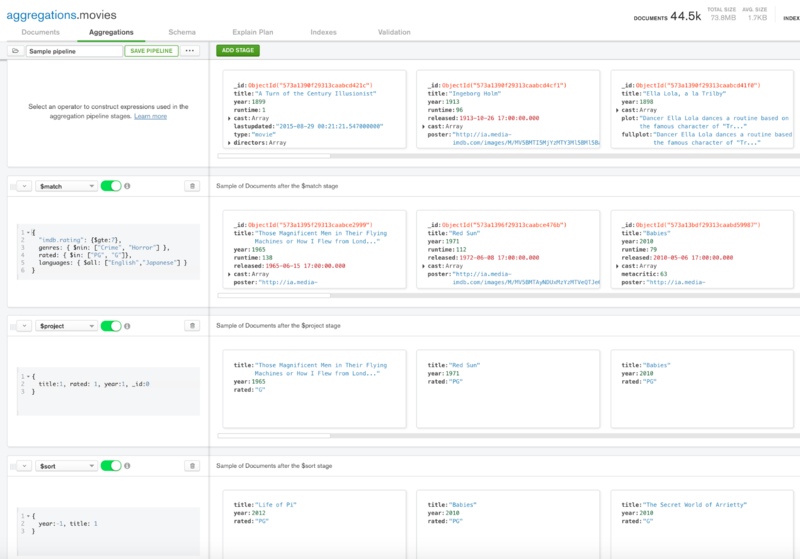 MongoDB Compass 1.14, including the aggregation pipeline builder, was released for general availability on June 26, 2018. Get Compass 1.14 from the Download Center. 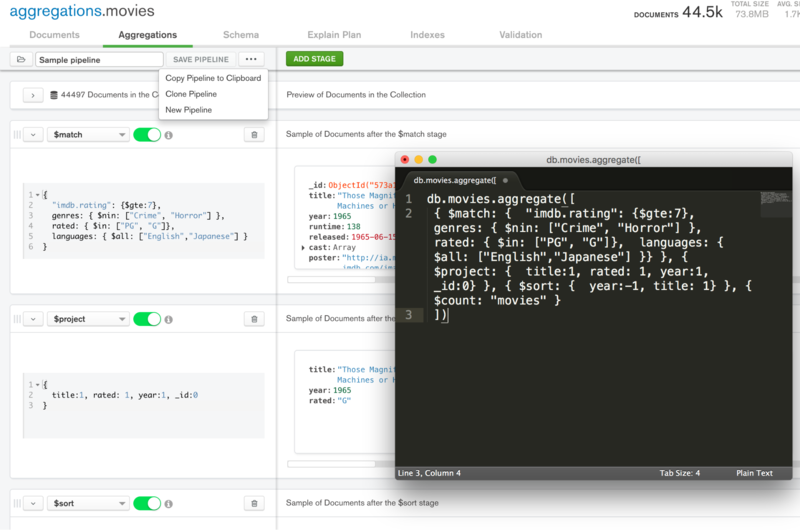 Building MongoDB aggregations has never been so easy. The most efficient way to analyze your data is where it already lives. That’s why we have MongoDB’s built-in aggregation framework. Have you tried it yet? If so, you know that it’s one of the most powerful MongoDB tools at your disposal. If not, you’re missing out on the ability to query your data in incredibly powerful ways. In fact, we like to say that “aggregate is the new find”. Built on the concept of data processing pipelines (like in Unix or PowerShell), the aggregation framework lets users “funnel” their documents through a multi-stage pipeline that filters, transforms, sorts, computes, aggregates your data, and more. The aggregation framework enables you to perform extensive analytics and statistical analysis in real time and generate pre-aggregated reports for dashboarding. There are no limits to the number of stages an aggregation pipeline can have – pipelines can be as simple or as complex as you wish. In fact, the only limit is one’s imagination when it comes to deciding how to aggregate data. We’ve seen some very comprehensive pipelines! With a rich library of over 25 stages and 100 operators (and growing with every release), the aggregation framework is an amazingly versatile tool. To help you be even more successful with it, we decided to build an aggregation construction user interface. The new Aggregation Pipeline Builder is now available with the latest release of Compass for beta testing. It’s available under the Aggregations tab. The screenshot below depicts a sample pipeline on a movies collection that produces a listing of the title, year, and rating of all movies except for crime or horror, in English and Japanese which are rated either PG or G, starting with most recent, and sorted alphabetically within each year. Each stage was added gradually, with an ability to preview the result of our aggregation. This easy-to-use UI lets you build your aggregation queries faster than ever before. There’s no need to worry about bracket matching, reordering stages, or remembering operator syntax with its intuitive drag-and-drop experience and code skeletons. You also get auto-completion for aggregation operators as well as query operators and even document field names. If you need help understanding a particular operator, click on the info icon next to it and you’ll be taken directly to the appropriate guidance. As you are building your pipeline, you can easily preview your results. 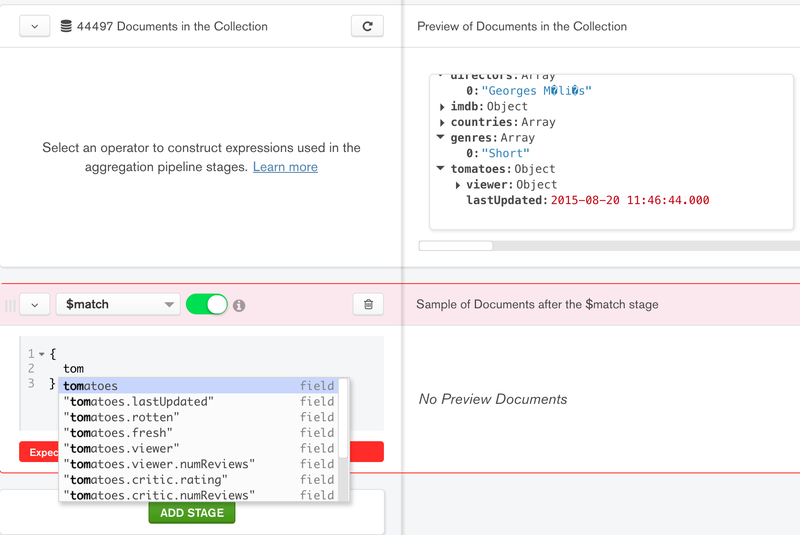 This, in combination with an ability to rearrange and toggle stages on and off, makes it easy to troubleshoot your pipelines. When you are satisfied with the results, the constructed pipeline can be copied to the clipboard for easy pasting in your code, or simply saved in your favorites list for re-use later! The aggregation authoring experience just got even more incredible with the new Compass aggregation pipeline builder. Why not check it out today? To learn or brush up your aggregation framework skills, take M121 from our MongoDB University – it’s well worth it! Also, please remember to send us your feedback by filing JIRA tickets or emailing it to: compass@mongodb.com.